It was another great year to be invested in this high-flying winner. 2015 has proven to be another great year to be an investor in Regeneron Pharmaceuticals (NASDAQ:REGN). Shares extended their multi-year winning streak, having soared more than 30% higher during the year, leaving the returns of the S&P 500 in their wake. 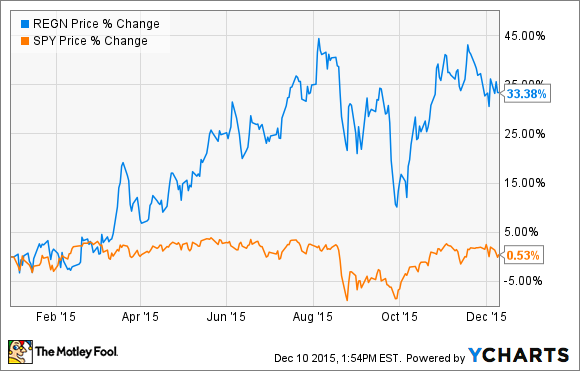 So what went right at Regeneron in 2015 to keep the good times rolling? Eylea, Regeneron's top-selling medication that treats several blindness-causing retinal conditions, showered investors with good news all year long. In February it gained European approval to treat visual impairment due to macular edema secondary to retinal vein occlusion, or RVO. RVO is a common retinal disease and is a major cause of visual impairment with an estimated 16.4 million people around that the world are affected by the disease. Just a month later Eylea grabbed another label expansion claim, this time in the U.S. Eylea was approved by the FDA to treat diabetic retinopathy in patients with diabetic macular edema, which is the most frequent cause of vision loss in patients with diabetes. As if that wasn't enough the Eylea news fairy had two more announcements to make later in the year. Eylea received regulatory approval in Japan to treat Retinal Vein Occlusion and it also grabbed another European Union expansion claim, this time as a treatment of visual impairment secondary to myopic choroidal neovascularization. Add all of these approvals up and Eylea's addressable market took a great step forward in 2015, positioning it well for continued strong growth. While the stream of label expansions news for Eylea on its own would have made 2015 a good year for Regeneron, the company received far bigger news during the year that looks to turbo charge its growth in the years ahead. Regeneron and its collaboration partner Sanofi (NASDAQ:SNY) announced in July that the FDA had officially given the green light for them to begin marketing Praulent, the first of a new type of cholesterol lowering medications called PCSK9 inhibitors. The news got even better just a few months later when the European Union gave Praulent the thumbs up. Praluent represents the first in a new, potentially game changing, class of cholesterol-lowering medications to gain FDA approval. PCSK9 inhibitors offer a new treatment option for the millions of patients nationwide who have trouble controlling their cholesterol levels, which is estimated to be more than 73 million Americans. In clinical trials, patients who used Praluent (in addition to statins) were able to lower their LDL cholesterol by a mean of 58% from pre-treatment levels, with minimal side effects. For now, Praulent is only approved for use by patients who have heterozygous familial hypercholesterolemia or clinical atherosclerotic cardiovascular disease, but even with that restrictive labeling, the market looks huge. Sanofi and Regeneron estimate that as many as 8 million to 10 million Americans alone currently fit that description. With the list price of Praluent currently set at $14,600 per year, it wouldn't surprise me to see this drug reach billion-dollar blockbuster status on its current addressable market alone. And, if all goes well with the ongoing long-term cardiovascular outcomes trial, then Praluent's addressable market could potentially expand to all of the 100 million or so Americans who have high cholesterol. You can image what the addressable market could look like when you add the European Union to the mix. 2015 proved to be a terrifc year for Regeneron Pharmaceuticals as the news of Eylea’s label expansion mixed with the approval of Praluent have positioned the company well for continued strong growth in the years ahead.